Bob and Wanda are my in-laws and have been very wonderful to me. While I recognize we’ll probably never have a normal son-in-law type relationship, they have gone out of their way to welcome me into the Wade family fold. For our first Christmas together, Bob (a renowned Texas artist) painted a watercolor of Kim as a child. It hangs by what is now our bedroom door. I love it. Wanda has been a bit trickier. She has been wonderful to me and never mean or cutting like another former mother-in-law which I dare not speak her name. She may materialize from the pits of Mordor. No, Wanda has been great but the problem lies in our personalities being very extroverted. We’ve never clashed but we’ve both had moments of “Huh?” with each other. Last Christmas Eve after the surprise wedding proposal, Mom, Mary, and I invited all of the Wades over for our traditional Christmas Eve dinner at my place. Kim would later share with me how Wanda was to remark how much nicer my place will look once someone “with some taste moves in here.” I fear she was referring to my shark head. None of these remarks are ever said with malice so I usually just laugh about it. How could anyone not love Sharky? Kim and Wanda talk frequently. Last week, it was a bit of a surprise when Kim shared part of her conversation where Wanda may have said one of the nicest things to me ever. I haven’t had the chance to thank her but it meant very much to me to hear that. Kim always says I’m doing fine but it’s nice to be reaffirmed. Lately I have a tendency to beat myself up and second guess because now that the summer and playtime is over, our little world here at the Geeky Hut has become less play and more work. Schoolwork. It’s odd being on the other side of the desk dealing with schoolwork especially when it’s your kids. Jude is doing fine but poor Roni is having a tough time. Sixth grade is where homework gets real and the CRCT kicks in. I also can’t believe what is being taught for sixth grade math. We had it easy. She is already doing basic algebra and geometry. Hell, I don’t get half of what is assigned to Roni for math homework. Thank God, Kim is good in math. I pick up the slack on Language Arts and Social Studies but my lovely wife runs the bases with the hard stuff. Many evenings are spent with much frustration. Roni is upset because she is not getting the math assignment. Kim and I are losing it because we can’t get Roni to listen to anybody else but the teacher. It was very reassuring when I spoke to a few colleagues who share their homework experiences with their own children are quite similar. Still I tend to internalize my problems and take on the weight of the world on my own shoulders. I always say how history repeats itself. Watching the way Roni and I argue reminds me of the arguments I used to see between the Big Guy and my sister, Mary. I realize much of this is eleven year old hormones, frustrations, and coping with the world but I also refuse to tolerate any child raising their voice to an adult. Roni is working on it but it is a bumpy road. Every now and then I get it right and last week, I hit a double with both kids. Roni was having a tough week and I decided to surprise her. Kim had mentioned how Roni had seen an ornament in the Hallmark store of Sully and Boo from Monsters, Inc. Roni remarked how the ornament reminded her of the two of us. Last Wednesday, I was late getting home because I ran by Oglethorpe Mall to pick that ornament up along with a card. I hid it in Roni’s backpack for her to discover while at school. The next afternoon, a little girl got off that bus with a smile so big I thought Roni’s face would break. Roni even wrote me a thank you note which I now keep on me to remind me we are doing fine. Jude is easy. I pretty much take the same approach with him that I take with my sister. I just think of something I’d enjoy and it usually matches up. 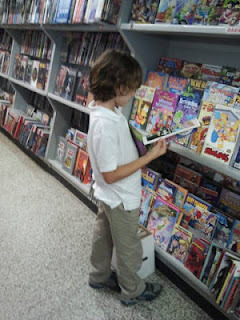 Recently, I introduced Jude to comic books and he loves them.
. On Thursdays, Roni has horseback riding so Jude and I are left on our own for the evening. We’ve started a weekly dinner date at B&D Burgers and a trip to the comic book store. I was about his age when I discovered Spider-man and Batman too so I get it. I think we also share the same reason why we love going to these comic shops. They have cool merchandise besides comics. I love this picture. 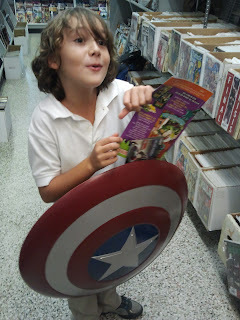 Jude has fallen in love with the Captain America shield and wants it so badly. I can’t blame him. I am an adult and I want the damn thing. "Can I have this, pleaaase?" I got my triple and even ran home last night when I made everyone happy. Kim had taken Roni to go see Gone with the Wind a few weeks ago at the Lucas Theater. They loved it and I can’t blame them. While I am not a huge fan of GWTW, I love going to the Lucas. The Lucas was the first movie theater in Savannah and goes back to the 1920s. My grandfather even did some electrical work there back when talking movies had just started. To walk around the place is to walk through history. The Lucas has been restored and going to see a movie there is an experience similar to how it must have felt back before the rise of the multi-plex and stadium seating. They even have balcony which amazed Jude and Roni. Roni had been there previously so she had to play nonchalant to Jude’s excitement. “Wow, they have a circular couch to sit on!” Jude would exclaim. Roni and I hung out a bit while Kim took Jude around to explore. This theater is not that big but there are lots of nooks and crannies which I could see being sensory overload to an eight year old. Here is a shot from their trip to the upstairs. The Richardson-Yancey clan does not often go out to watch movies. I think in our short time together we have only ventured out as a group to watch The Muppets, The Avengers, and Raiders of the Lost Ark. I was a bit worried about going to see Clue and how the kids might get bored. I was wrong. They were as mesmerized watching Tim Curry unravel the great mystery of who killed Mr. Boddy as when we watched Thor battle the Hulk and Indy rescue the Ark of the Covenant. I honestly believe part of the magic last night was the setting. 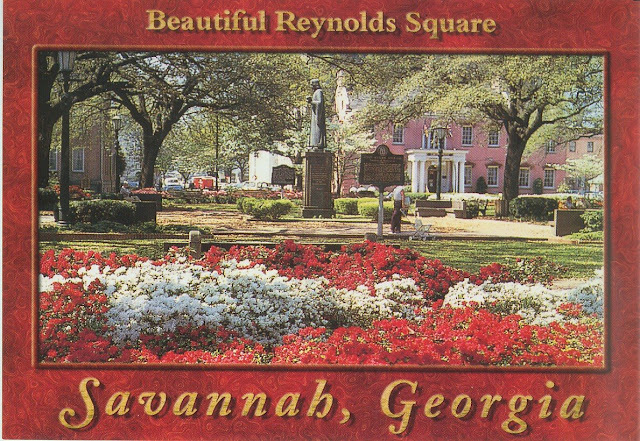 There is something magical about a Savannah evening in the Fall. Sometimes I forget how Kim And the kids aren’t from here and they are still learning all the history and culture that comes from being a Savannah resident. My Pop and the Big Guy shared those lessons with me and now I am happy to return the favor with my new family. Walking out of the theater, Roni sidled up to Kim and began walking hand in hand. Not to be left out, Jude grabbed my hand and held it tightly as we walked through Reynold’s Square. I realized the statue of John Wesley was spooking him. “Jude asked, “Robby, was this where you used to tell your ghost stories?” Jude was referring to my time as a ghost tour guide several years ago. Apparently, I hit upon what was worrying Jude. He squeezed my hand and then kissed it. We walked back to Kim’s mini-van. Occasionally, Jude would ask a question about certain buildings and what it was like to grow up here as a kid. I happily shared those answers with him. We caught up with Kim and Veronica. I realized a few things on the ride home. I do have a real family just like I always dreamed of. I have an amazing wife who still captures my imagination just as much as my heart. I am helping raise two amazing kids who have the almost super-hero like ability to make me second guess everything I do as well as melt my heart. I may not be their real dad but love doesn’t recognize genetics and none can take that from me. I have been beating myself up and I need to quit. Parenting is not an exact science and mistakes are going to be made. The kids didn’t come with a text book to follow but they did come with a mother who is an expert. I just need to relax and follow Kim’s lead more. While it may feel like a lot longer, sometimes years depending on the day, I have only been doing this step-dad thing for barely six months. Much like riding a bike, playing the guitar, and completing the Red Dead Redemption Gunslinger Challenges, I am getting the hang of this and my confidence in my parental abilities is growing no matter how much I grumble at myself. Don’t take my word for it. Ask my mother-in-law. On a side note, I have recently passed the two year mark on writing the Afternoon Tide as a blog. I wanted to take second and show my appreciation to all of you stop what you are doing and read my ramblings about pop culture, piracy, storytelling, and attempts at parenting. It means the world to me. Thanks for reading my blog.